Gelatin (gelatine) is what most people would consider jelly, so assuming you were once a child and/or ever went to a birthday party then you're already familiar with some of the properties of gelatin! It is a common ingredient that now finds new uses as in molecular gastronomy supplies. One of the great things about gelatin is how it feels when you roll it around your tongue, this is because it melts at body temperature – gelatine is literally melt-in-the-mouth tasty! This is referred to by molecular gastronomy practitioners as mouth feel it is something every child knows even if they don't know that they know it. Where does gelatin come from? Gelatin is extracted from meat (pork, beef, chicken, horse) or fish. Unless the label states otherwise it is safe to assume that pork is the source of any gelatine you purchase. Anything labelled as “vegetarian” would not be gelatine but another vegetable based hydrocolloid. The industrial extraction process involves acid/alkali plus many purification stages which are essentially to remove any potential flavour from the gelatine and also any potential gelling inhibitors (salts). You can simply make your own gelatine by taking a part of the animal that contains lots of collagen, which is found in its highest concentration in tendons. The obvious choice would be pig's trotters because they are cheap and contain a lot of tendons. Simply boiling the trotters will hydrolyse the collagen to create gelatine. (hydrolysing basically means breaking the linkages within and between the tough, insoluble collagen molecule to release the water soluble gelatin. The use of the acid/alkali in the industrial process is to make the process more efficient. The gelatin you make yourself will have an undeniably “meaty” taste and aroma making it completely useless for creating gummy bears! Gelatin (gelatine) is what most people would consider jelly, so assuming you were once a child and/or ever went to a birthday party then you're already familiar with some of the properties of gelatin! 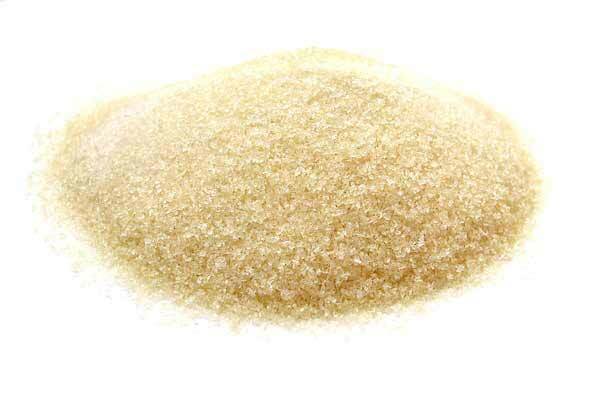 It is a common ingredient that now finds new uses as in molecular gastronomy supplies. One of the great things about gelatin is how it feels when you roll it around your tongue, this is because it melts at body temperature – gelatine is literally melt-in-the-mouth tasty! This is referred to by molecular gastronomy practitioners as mouth feel it is something every child knows even if they don't know that they know it. Gelatin is extracted from meat (pork, beef, chicken, horse) or fish. Unless the label states otherwise it is safe to assume that pork is the source of any gelatine you purchase. Anything labelled as “vegetarian” would not be gelatine but another vegetable based hydrocolloid. The industrial extraction process involves acid/alkali plus many purification stages which are essentially to remove any potential flavour from the gelatine and also any potential gelling inhibitors (salts). You can simply make your own gelatine by taking a part of the animal that contains lots of collagen, which is found in its highest concentration in tendons. The obvious choice would be pig's trotters because they are cheap and contain a lot of tendons. Simply boiling the trotters will hydrolyse the collagen to create gelatine. (hydrolysing basically means breaking the linkages within and between the tough, insoluble collagen molecule to release the water soluble gelatin. The use of the acid/alkali in the industrial process is to make the process more efficient. The gelatin you make yourself will have an undeniably “meaty” taste and aroma making it completely useless for creating gummy bears! The properties of gelatin help explain how it is used. Gelatin is water soluble, once hydrated and melts at 40 degrees. It solidifies at 15 degrees. Gelatine denatures to release water if frozen. Gelatin is destroyed by boiling. Concentrations of anything from 0.5% to 2% will cause gellification. Whichever form of gelatine you're using (sheet or powder) it needs to be soaked in water to hydrate it before it can be dispersed and melted, to do this simply take the gelatin and place in cold water for 10-15 minutes – it will feel soft when ready. Mix it with the liquid you intend to gel and heat above 40 degrees but do not boil, or the jelly will fail to set firmly. Gelatin demonstrates state hysteresis between 15 and 40 degrees. This means that although it must be set at below 15 degrees, it will not melt until it reaches body temperature. This is why jelly are so much fun to eat, they melt in your mouth – literally! Gelatin cannot be sheered, it will reform so even of it has set for example inside a whipped cream dispenser, the use of cream chargers will only temporarily break the set, the foam created will re-gel. Bloom strength refers to a scale for measuring the strength of jelly the “Bloom Test”, it is basically found by balancing masses of a known surface area upon a jelly and seeing at what point they being to sink. Not all manufacturers refer to bloom strength on the packaging and in any case a larger amount of weaker gelatin will make the same strength as a smaller amount of weak gelatin. Manufactures call there gelatin things like “bronze standard” or gold, platinum of list the Bloom strength of perhaps 200. However it is far better to simply use the same brand each time a note what quantities give a satisfactory gel. The most obvious case of when to use gelatin as a molecular gastronomy ingredient is in the making of vodka jelly shots, probably everyone’s first attempt at molecular mixology! The fact it is so easy to make vodka jelly shots lets us know how forgiving an ingredient gelatin is if treated with care it will accommodate alcohol strengths of up to 40%. Another use of gelatin is for stabilizing foams for use with cream whippers and nitrous chargers, remember when using it for this that the foam will break down if warmed. 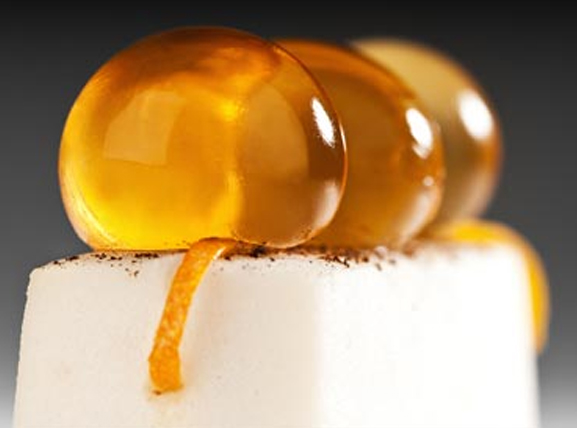 Molecule-r include cold soluble gelatin in their molecular gastronomy kits, but even then it is recommended to warm up any recipes to ensure maximum strength foam. You can use cream chargers to make anything from a light espuma to a dense coconut foam depending upon the concentration of gelatin you use. Just about any flavoured liquid with a 1% gelatin mix can be used in molecular mixology to create a floating foam topping to a cocktail. Gelatin is a ubiquitous ingredient in many processed foods and is used as thickener or setting agent in many things. Custard, ice cream, yoghurt – one of the properties that make this possible is that fact that a set jelly will reform, so if you stir a thickened liquid, it will liquefy but then immediately begin to set again. This is very useful for low fat products that don't have any natural fat the thicken them. Gelatin can be used to filter liquids, such as apple juice. To do this simply make a gel out of the liquid and then put it in the freezer until frozen solid. The gelatin proteins will be denatured by the freezing process so will no longer hold any water (syneresis) the gelatin matrix will however still hold any non-soluble solids in clusters, so a clarified liquid will dip out of the frozen gelatin block as it melts – al you need to do is sit the ice-block on a towel, in a colander and catch the drips. It goes well beyond molecular gastronomy, beyond jelly and ice cream and beyond vodka jelly shots. Gelatine is also used in coating medicines capsules, suppositories, photographic paper and is in glues. Its ubiquity is one of the reasons why being a true vegetarian in the modern world is a near to impossible task. Cheeky Monkey molecular is working on an entire range and recipe collection based upon the humble vodka jelly shot, so if you start learning how to use gelatin with you molecular gastronomy kits now, you'll be well practised when it comes to the fun stuff in the future.